Rocket-in-Bottle: FeedSquares for Chrome - Supercharge your Google Reader! FeedSquares for Chrome - Supercharge your Google Reader! Want a refreshing way to use Google Reader? 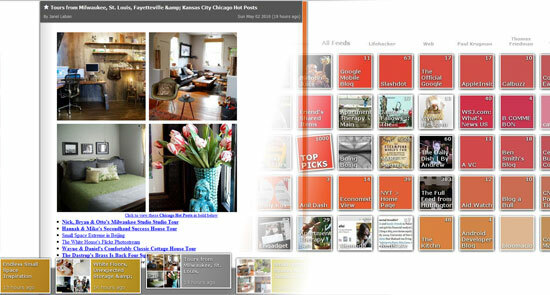 Check out FeedSquares for Chrome now and begin to read your favorite feeds in style! It's beautiful, it's easy to use, and Google agrees - we have just been picked by Google Chrome team as a top extension! If you are not using Google Chrome as your browser, come see one more reason why you should. Google has definitely done a great job on Google Reader's default interface. But after sticking with the same interface for years, you might be itchy for something new. If you are a visual person, or you just love to see what "HTML5" can really do, or you just want to try new, beautiful things, you should check out FeedSquares! FeedSquares fully synchronizes your subscriptions and items' read/star statuses from and to Google Reader. It gives you a visual, personalized lightweight listing of feed items with image previews. It also provides easy sharing to your Reader stream, twitter and such. Make no mistake about it, despite the ease of use, we also provide a full arsenal for the feed warriors out there to battle their unread counts. Shortcut keys is coming up in the next version. Now I hope for ReadItLater support, then it'll be 100% PERFECT ! I'm using the Android version and it's very comfortable, not only a visual upgrade. But I miss one thing: i have a lot of feeds and i would like to hide folders and feed without unread items. Perhaps i can't find the options or it's not supported. In that case it would be awesome. It was nice to read many good info in this survey. To improve the business it's proposed to use it development company to appear on IT markets. Software development allows to automate business processes and earn more profit funds.